Previously, it was difficult to find a straight-up list of all your Tasks. They can be created in several different places, but there was no centralized place to find them all. Get more done with the Google Tasks mobile app. Integrations with Gmail and Google Calendar help you get tasks done – faster. Manage, capture and edit your tasks from anywhere, at any time, with to-dos that sync across all your devices. The user interface is very good for App. Using the app you can create standard to-do lists. You can create and manage your task list in the app, and break down tasks into subtasks. The app is also now considered a part of Google’s G Suite. Being able to access the tasks you created elsewhere is useful, as is syncing your changes back to the inbox. • Easy to break down your tasks into subtasks. • Add your focus task details very fast. • When your work progresses update details according to that. • Easy to create task lists with your most important to-dos. 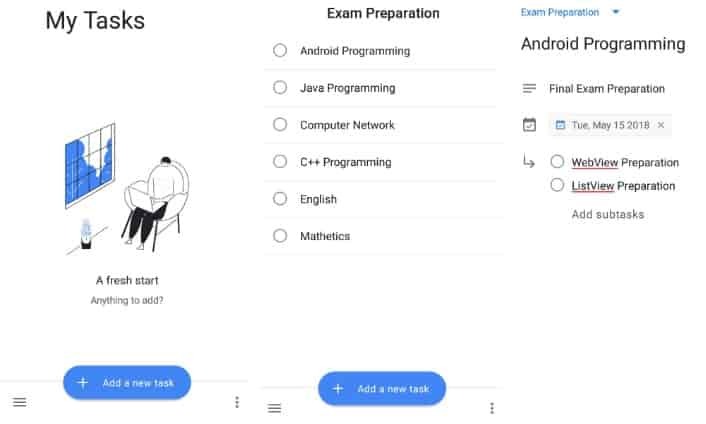 For Example, Task for Exam preparation. • Manage tasks created in Gmail or Calendar on the web from your mobile device. • You can view, edit and manage tasks from any device. • To achieve your goal you can set a due date for every task. • Using drag-and-drop you can organize your tasks by date or prioritize. • You will get notification reminders to keep your tasks on track before the due date has come. • It is possible to create the task directly from your Gmail Account. • In a side panel of Gmail, you can see your task lists. So when you open your Gmail it will also remember you your task list. • You can trace a task back to its source email. • Suing this app you are bringing Google’s suite of powerful, intelligent apps to your business. • The energy of Google’s AI to bring data insights and analysis to every employee of the company. • Connect with your team seamlessly using one suite: Gmail, Tasks, Calendar & more. Sure, there are other, less simplified to-do list apps on the market. The Google Task is the very simplified app and the app is very good from other apps on market. Als the app is very easy to use by none technical person also. But Google Tasks is free to use and it works on the desktop. For users of Google Tasks, this new app should make the experience a lot better. We surely say the Google Tasks app has a very simple, clean, and barebones UI. This should make the Tasks situation a lot easier to understand.